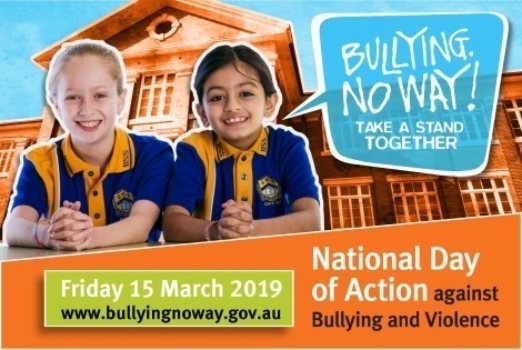 On Friday 15th March, the whole School will mark The National Day of Action against Bullying and Violence (NDA). There will be a wide range of activities and incursions taking place during the day across the whole school. The NDA is an opportunity for students, teachers, parents and the whole community to take a stand together against bullying and violence. Bullying is an ongoing and deliberate misuse of power in relationships through repeated verbal, physical and/or social behaviour that intends to cause physical, social and/or psychological harm. It can involve an individual or a group misusing their power, or perceived power, over one or more persons who feel unable to stop it from happening. Bullying of any form or for any reason can have immediate, medium and long-term effects on those involved, including bystanders. Single incidents and conflict or fights between equals, whether in person or online, are not defined as bully-ing. 1. Listen calmly and get the full story. Your calm response is important to allow your child to tell you all about the situation. After they have told you their story, ask questions to get more details if you need- who, what, where, when. Although you may feel some strong emotions about your child’s experience, try to keep calm to avoid more distress to your child. 2. Reassure your child they are not to blame. Many children blame themselves and this may make them feel even worse. You could say things like, ‘That sounds really hard to deal with. No one should have to put up with that.’ or ‘I’m so glad you told me. You should be able to feel safe at school; that’s not fair at all’. 3. Ask your child what they want to do and what they want you to do. A critical part of your response is to avoid jumping in to solve the problem. While it is natural to want to protect your child, helping them to find their own solution is a better option. It helps them feel they have some power in the situation. 4. Visit www.bullyingnoway.gov.au to find some strategies. The website has tips and ideas for different bullying situations. One idea is to practise strategies at home to help your child feel more confident. 5. Contact the school. Your child may be reluctant for you to do this, so discuss the idea and reassure them that the school would want to know and is able to help. Make an appointment to meet with your child’s teacher/tutor. Contact the school immediately if you have a concern about your child’s safety. 6. Check in regularly with your child. Keep the conversation going. It can take time to resolve issues, so check in regularly with your child about their experiences and their feelings. Your ongoing support is important.